Mmm. 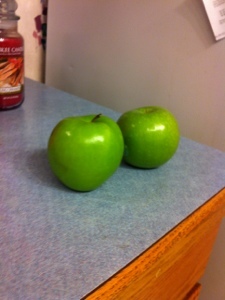 Apples. The recipe calls for 5, I only had 4, you really do need 5, I had leftover jello yumminess. 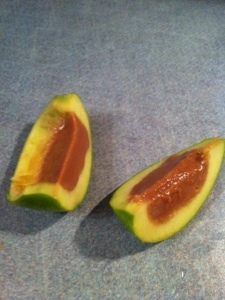 Cut each apple in half and scoop out seeds and meat to make a nice jello shot shell. Note: Do not cut out stem area because jello liquid leaks. I learned my lesson. 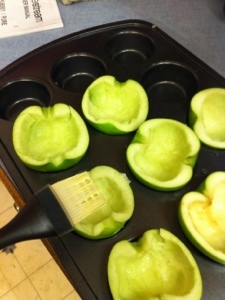 Put apples in a muffin pan. Genius! Brush apple cups with lemon juice to prevent browning. In a medium saucepan, combine water with hot chocolate mix and whisk until the cocoa dissolves. Add evaporated milk and caramel sauce and whisk again to combine. Sprinkle gelatin onto mixture evenly and allow to sit about 2 minutes. Heat the mixture over medium-low heat, whisking occasionally, until it just reaches a gentle simmer — this is to ensure gelatin is fully dissolved. Add sugar and simmer gently for about a minute. Turn off the heat and let mixture cool to warm. Add vodka. Transfer to a container with a spout. 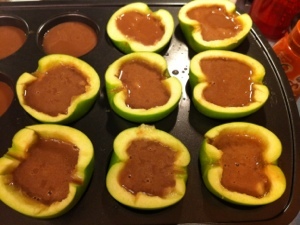 Fill each apple half with jello filling. I had leftover so I put them in the muffin tin. Refrigerate. 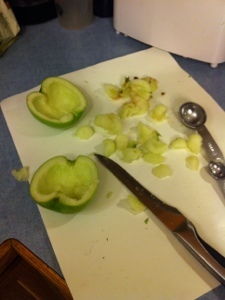 Cut slices out of each apple half and serve. Note: These are “dangerous”. Besides being absolutely amazing, the apple shell kills the alcohol note and makes you think you can eat a hundred of these. If you do, you may find yourself waking up on the neighbor’s lawn spooning with their lawn gnome. Just a fair warning.